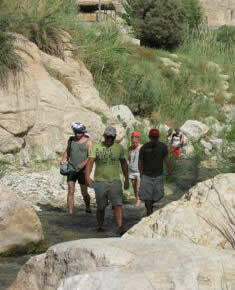 Transfer to Wadi Ibn Hammad, you will trek 4-5 hrs, this place is a beautiful Wadi with mountains, hot springs and waterfalls. There you will walk in the water. 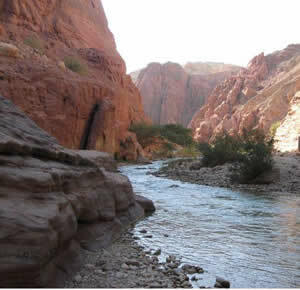 The water level in the canyon can reach up to knee level and even to waist level, depending of the season. Hot spring swimming pool is a nice relief after trekking. Dinner and camp. 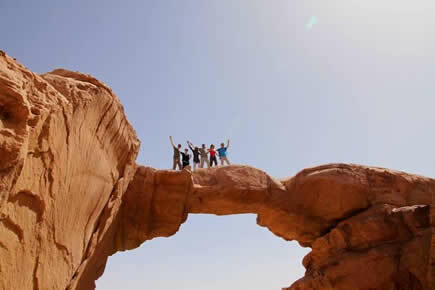 After breakfast, you’ll go to Wadi Hessa for a 2hrs trek. In Wadi Hessa there is spectacular views, subtropical oasis, sandstone narrow siq, lush hanging gardens and waterfalls. Lunch, go to Feynan by car – dinner and camp. After breakfast, we’ll go to Wadi El Gweir for 2hrs trek, there is a stream flowing in the canyon and you find your feet in the water. In springtime, the ponds can be deeper, and it is possible that you have to swim for a few meters. You'll see the hanging gardens of ferns and palms and also beautiful dark green mountains (copper). 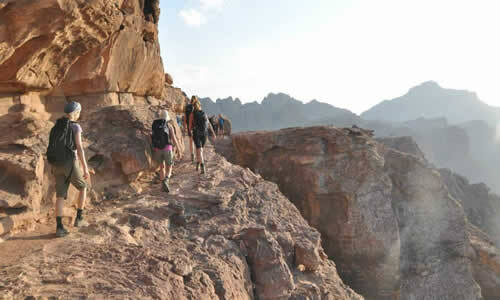 Lunch, then you will go to Wadi Araba – dinner and camp . Two Full days horse riding in Wadi Araba. 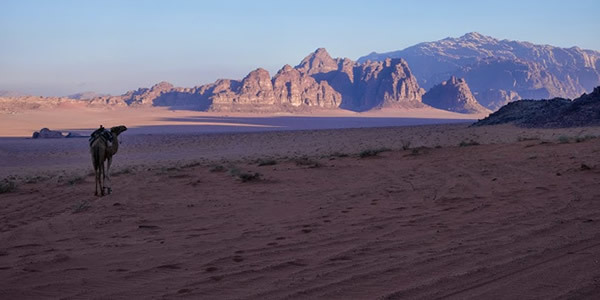 Wadi Araba is one of the Jordanian deserts. It’s 200 to 300 meters below sea level and the climate is very warm. 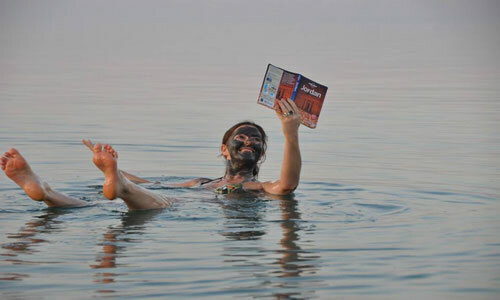 You will enjoy the peace and the wonderful scenery with plenty of dunes and valleys . 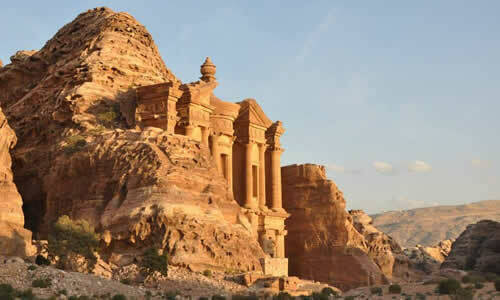 Full day in Petra. 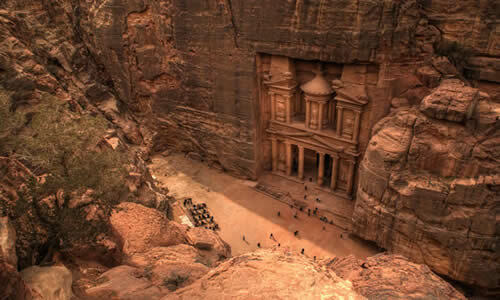 The visit will start from the back (Little Petra to Monastery…). Full day trekking in Little Petra – Ferch (high place with panorama) – Al Hesha stunning view of Petra mountains, Little Petra and Wadi Musa. Dinner and night in cave. By car we will go to Radjef and Glara. From there we will take camels and go to Thora where there is a nice view of Wadi Rum mountains. Dinner and camp . 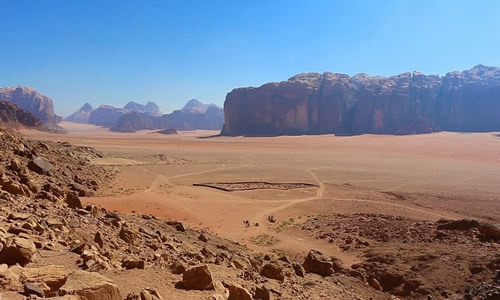 By camel, we’ll go to Wadi Rum. Dinner and camp. In Jeep tour, you will visit the most interesting places in this desert: Lawrence Spring, Siq Khaz ali, Red Dune, Um Fruth Rock Bridge, Burda Rock Bridge, Lawrence House, An-Faishyya inscriptions. – dinner and camp.